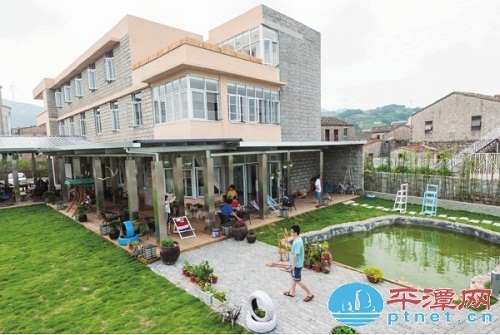 A youth hostel,the first of its kind in Pingtan, has settles in Guocai village, Baiqing township, Pingtan, Fujian province. The youth hostel has been designed to promote green and eco-friendly accommodation as well as encouraging more backpackers and tourists to visit the area. The hostel has been renovated from an old three-story building to feature aspects of the rural environment. The renovation preserved the building's original style of that of a stone stone with the outer walls colored yellow and light gray. The interior of the hostel features white walls and antique corridors leading to wood-floored rooms, creating a clean and comfortable environment. The hostel's garden features walkways, plants and areas for guests to rest, as well as a vegetable patch and tranquil lotus pool. Both inside and out has been decorated with local ornaments such as driftwood, old cane shields and fishing gear,which enables visitors to gain a better understanding of Pingtan through the design and decoration of the property.